Joris was appointed Project Crimson Chair in 2015. His involvement in Project Crimson started when he was Public Awareness Manager and General Manager External Relations in the Department of Conservation from 1992 to 2002. Prior to this, he has worked as a community organiser, teacher, journalist and public sector trade union official. Joris was the New Zealand Race Relations Commissioner from 2002 until 2013. Joris came to New Zealand from the Netherlands with his parents at the age of seven. Growing up in a harbourside suburb in Auckland, pohutukawa was never far away. They are just as present and cherished in Island Bay, Wellington – where he and his wife Angela now live. 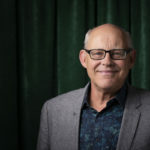 Joris is also an Honorary Advisor to Multicultural New Zealand, the Federation of Multicultural Councils, and the Community Languages Association of New Zealand, among others.